Licorice is a Black finish rubbed to expose worn edges and rounded corners. Licorice includes light chain distressing. Nickel glaze is applied to accent the wood and profiles. Licorice is available on Maple, Oak and Quarter Sawn Oak cabinetry. Amaretto and Bordeaux are Black finishes with rounded and worn corners. Additional worn areas on center panels and door frames expose golden butterscotch tones on the Amaretto finish and beautiful burgundy tones on the Bordeaux finish. 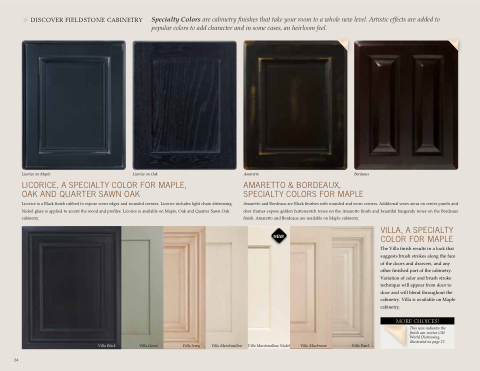 Amaretto and Bordeaux are available on Maple cabinetry. The Villa finish results in a look that suggests brush strokes along the face of the doors and drawers, and any other finished part of the cabinetry. Variation of color and brush stroke technique will appear from door to door and will blend throughout the cabinetry. Villa is available on Maple cabinetry.